Not to be confused with Act of Tilsit. Meeting of the two emperors in a pavilion set up on a raft in the middle of the Neman River. The Treaties of Tilsit were two agreements signed by Napoleon I of France in the town of Tilsit in July 1807 in the aftermath of his victory at Friedland. The first was signed on 7 July, between Emperor Alexander I of Russia and Napoleon I of France, when they met on a raft in the middle of the Neman River. The second was signed with Prussia on 9 July. The treaties were made at the expense of the Prussian king, who had already agreed to a truce on 25 June after the Grande Armée had captured Berlin and pursued him to the easternmost frontier of his realm. In Tilsit, he ceded about half of his pre-war territories. From those territories, Napoleon had created French sister republics, which were formalized and recognized at Tilsit: the Kingdom of Westphalia, the Duchy of Warsaw and the Free City of Danzig; the other ceded territories were awarded to existing French client states and to Russia. Napoleon not only cemented his control of Central Europe but also had Russia and the truncated Prussia ally with him against his two remaining enemies, Great Britain and Sweden, triggering the Anglo-Russian and Finnish War. Tilsit also freed French forces for the Peninsular War. Central Europe became a battlefield again in 1809, when Austria and Great Britain engaged France in the War of the Fifth Coalition. Following the end of the Napoleonic Wars in 1815, the Congress of Vienna would restore many Prussian territories. The treaty ended war between Imperial Russia and the French Empire and began an alliance between the two empires that rendered the rest of continental Europe almost powerless. The two countries secretly agreed to aid each other in disputes. France pledged to aid Russia against the Ottoman Empire while Russia agreed to join the Continental System against the British Empire. Napoleon also convinced Alexander to enter into the Anglo-Russian War and to instigate the Finnish War against Sweden to force Sweden to join the Continental System. More specifically, the tsar agreed to evacuate Wallachia and Moldavia, which had been occupied by Russian forces as part of the Russo-Turkish War, 1806-1812. The Ionian Islands and Cattaro (Kotor), which had been captured by Russian admirals Ushakov and Senyavin, were to be handed over to the French. In recompense, Napoleon guaranteed the sovereignty of the Duchy of Oldenburg and several other small states ruled by the Tsar's German relatives. A French medallion dating from the post-Tilsit period. 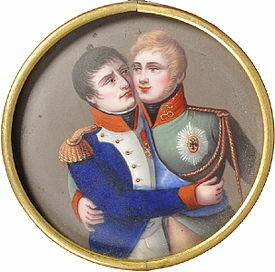 It shows the French and Russian emperors embracing each other. The treaty with Prussia stripped the country of about half its territory: Cottbus passed to Saxony, the left bank of the Elbe was awarded to the newly created Kingdom of Westphalia, Białystok was given to Russia (which led to the creation of the Belostok Oblast), and most of the Polish lands in Prussian possession since the Second and Third Partitions became the quasi-independent Duchy of Warsaw. Prussia was to reduce the army to 43,000 and on 9 March 1808, France fixed its tribute to be levied from Prussia at 154,500,000 francs (= Prussian dollar 41.73 mio. ), deducting 53,500,000, which had been raised so far during the ongoing French occupation, the sum was lowered in two steps to 120 million francs by 1 November 1808. Talleyrand had advised Napoleon to pursue milder terms; the treaties marked an important stage in his estrangement from the emperor. Until 1812, the French occupants requisitioned in money and kind from various corporations and persons, especially by billetting soldiers on cities, further contributions additionally amounting to between 146 and 309 million francs, according to different calculations. The Prussian government indebtedness soared between 1806 and 1815 by thaler 200 million to altogether 180.09 million interest-bearing debts, 11.24 million non-interest-bearing unconsolidated treasury notes and another 25.9 million former provincial debts assumed by the royal government. The cities' debts, especially those of Berlin often billetted on, were not assumed by the Prussian government. Since the creditors deemed Prussia to be over-indebted in 1817, the 4-per cent state bonds were traded at the bourses with a disagio of 27 to 29 per cent, in 1818 even with a discountor of 35 per cent, causing the effective interest to rise to 6.15 per cent. At restructuring part of the debts in 1818 by a £5 million loan (= thaler 30 million) at 5% at the London financial market, the Prussian government had to accept a disagio of 28⅓%, thus paying an annual effective rate of 6.98%. When the Treaty was being formulated, it was noted by an observer that the Prussian king was pacing on the bank of the Neman river; Napoleon had to "but raise his hand, and Prussia would cease to exist" (McKay). Hence, many observers in Prussia and Russia viewed the treaty as unequal and as a national humiliation. The Russian soldiers refused to follow Napoleon's commands, as the Lisbon Incident demonstrated to all Europe. Napoleon's plans to marry the tsar's sister were stymied by Russian royalty. Cooperation between Russia and France eventually broke down in 1810 when the tsar began to allow neutral ships to land in Russian ports. In 1812, Napoleon crossed the Neman river and invaded Russia, ending any vestige of alliance. Prussia in 1807 (orange) and its territories lost at Tilsit (other colours). ^ Some of the Westphalian possessions had been ceded earlier, and no compensation was paid for these losses under the terms of the treaty of Tilsit. ^ The Encyclopædia Britannica, 11th ed., vol. 2, 620. ^ a b c d Georg Sydow, Theorie und Praxis in der Entwicklung der französischen Staatsschuld seit dem Jahre 1870, Jena: Fischer, 1903, p. 49. ^ Herbert Krafft, Immer ging es um Geld: Einhundertfünfzig Jahre Sparkasse Berlin, Berlin: Sparkasse der Stadt Berlin West, 1968, p. 10. ^ a b Herbert Krafft, Immer ging es um Geld: Einhundertfünfzig Jahre Sparkasse Berlin, Berlin: Sparkasse der Stadt Berlin West, 1968, p. 9.